This past weekend Doug and I headed to Scottsdale, AZ to visit my dad and step-mother and celebrate my dad's birthday. It is a rare and special treat to celebrate my dad's birthday with him and I loved every minute of it. We had a great, relaxing weekend in the perfectly warm desert sun. On the day of our arrival we had a late afternoon snack outside. This is one of my favorite go to's and can be made super fast. 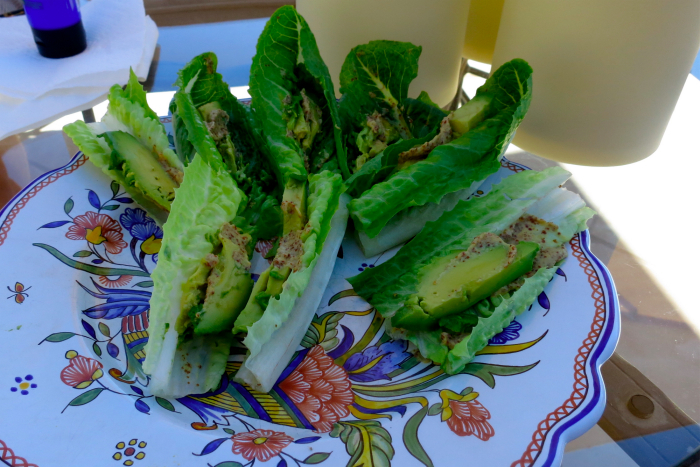 Romaine + mustard + avocado = a light and delicious wrap! My dad's birthday dinner was just perfect. So much fun in such a beautiful setting. I didn't get any pictures at dinner, but it truly was delicious including a tomato and guacamole "caprese salad" that I cannot wait to recreate. The next day my dad, Doug and I went to the brand new Salt River Field to see the Rockies vs. the Reds in a spring training game. Even though neither of our teams were playing (Red Sox for me and Doug, Yankees for my dad) we still had a great time. Knowing it was unlikely I would find any healthy snacks at the game I planned ahead with a trip to the (amazing) Scottsdale Whole Foods. In fact, the local Whole Foods was so awesome that it deserves it's own post (coming tomorrow). Into my purse went a small tub of guacamole, baby carrots, Go Raw Carrot Cake Super Cookies, Sea Tangle Snacks, and a Larabar for Doug (heard of Cookie Monster? I call Doug Larabar Monster). My dad especially loved the Go Raw cookies ( he even had the brilliant idea to dip them into guac!). I may just send him a care package of them! Check in tomorrow to find out just how awesome the Whole Foods in Scottsdale is!